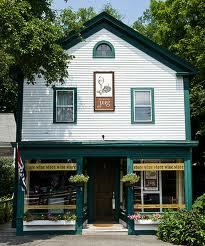 The home that is now our Cape Cod Bed and Breakfast, stands in the heart of historic Sandwich, MA. It was built in 1750 and owned by the Hall family until 1929. Hall family members participated in, and contributed to, the growth of Sandwich. They watched the ups and downs of the community from pre Revolutionary War to the Great Depression. The families’ fortunes may have followed the same course as the towns. It is unclear from the records left behind, but many kind words have been recorded about Hall family members by their peers. The Village of Sandwich and the Halls suffered through the Revolutionary War’s demands for men and supplies. No records exist to tell of the service of the Hall men, but all residents made many large contributions in the form of service time and/or money and goods contributed to sustain the Continental Army. Cape Cod and Sandwich were also disportionately impacted by the shipping disruptions and sea blockades of the War of 1812. Even in spite of all the difficulties, Sandwich continued to grow. The earliest ‘census’ records show in 1750 about 209 families with about 1254 members, and in 1790 about 326 families with about 1991 members. The first official Federal Census of 1820 shows another 25% growth to 452 families with 2484 members. During the hard war times and growth times, the Hall family lived at 118 Tupper Road, then called Franklin Street. In about 1830, Jonathan Hall (1799-1879), Elisha Hall’s son, may have expanded the original family ‘saltbox’ home into the Federal style home we have today. The Historical Commission and a subsequent owner of the house had considerable correspondence in the 1970’s about the degree to which the existing house includes the original 1750 structure. Some think it obvious that much of the chimney and remaining five fireplaces are original, and there are still many ancient hand-hewn timbers in the basement and roof providing key structural support. We know for sure that most of what we see today, including the first floor dental molding and wainscot, are from this 1830 expansion, as is the narrow pine flooring that was laid on top the wide board pumpkin pine still visible in some first floor rooms. 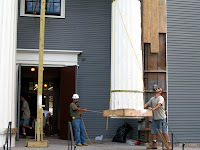 A new ‘summer’ kitchen was also added to the rear of the house which today is our year round kitchen. Regardless of what was built when, our Sandwich Bed and Breakfast stands today as a tribute to the skills and craftsmanship of those early Hall family members. 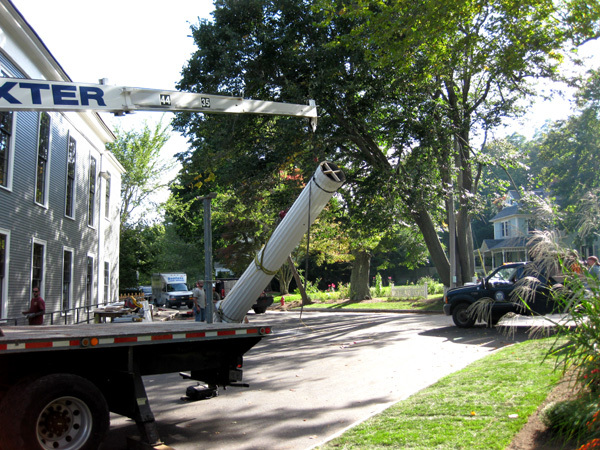 While Jonathan Hall was expanding his house, the neighborhood around him was also changing. 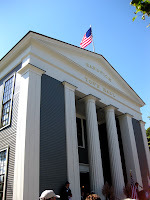 In 1834, the completion of the new Sandwich Town Hall (just restored and rededicated on October 2) solidified our location as the heart of Sandwich. Other families followed the trend and built new Colonial and Federal style homes, including Ezra Goodwin’s 1815 Brick Federal at 100 Tupper (then Franklin Street). Also in 1830s, Seth Nye first built his Federal home a 2 Grove street across from Town Hall, followed shortly by his law office at 4 Grove Street. That office was almost immediately expanded, the left portion added for use by Nye’s sister. 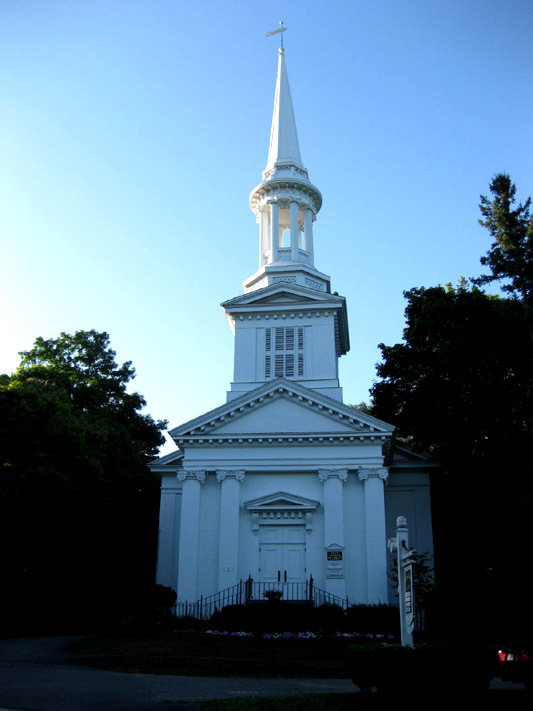 The magnificent First Church of Christ, around the corner from our Inn, was built in 1847 for the Calvinistic Congregational Society. Its’ image was on the cover of Elvis Presley best selling 1968 gospel album. All of these wonderful buildings are part of the Town Hall National Registry District and are a short walk of our Inn. In the early 1800s, Jonathan Hall and his son, Charles Bascom Hall, may have past Dan’l Webster on Main Street by the Fressenden Tavern. Mr. Webster liked to come to Sandwich to fish and relax, and it is said he wrote some of his most famous orations in his room at the Tavern. Today, in his honor, we have the Dan’l Webster Inn, a Sandwich landmark in its own right and a direct descendent of that first Fressenden Tavern. 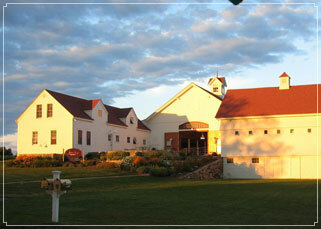 Our Sandwich Bed and Breakfast and all of Sandwich Village are part of the wonderful history of this great country. 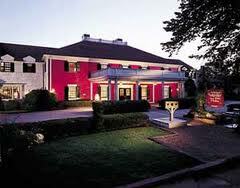 Come stay and experience it as we celebrate our 260th anniversary with specials and holiday packages. Do you think I can find wines in New England to serve to guest at our Sandwich Bed and Breakfast? Is a wonderful Connecticut wine an oxymoron? I almost didn’t go to the Wednesday wine tasting at the Belfry Bistro here in Sandwich because it was the Jonathan Edwards Winery from North Stonington Connecticut. I was pleasantly surprised by the wines and intrigued by the story behind the wines. Mark, representing the winery, told the story well and the Belfry pared wonderful appetizers with each of the four wines served. Often, the story behind a wine is as much fun as the wine. Mark did declare up front that this winery has no connection to the past North Carolina senator and twice presidential candidate John Edwards. Now that would be an interesting story. This Jonathan Edwards’ website declares “New England Charm. Napa Style.” What does that mean? The Edwards’ family approach includes a state-of-the-art winery on a bucolic New England farm near the Connecticut sea-coast, where select varieties of grapes are grown and processed into Estate Wines, and another line of wines that are made with grapes from Napa Valley. Jonathan Edwards lived and worked as a winemaker in Napa Valley and established relationships with select growers of different grape varietals. Through long-term contracts, the Connecticut winery has a consistent supply of some great Napa grapes. Jonathan Edwards was not at the Wednesday tasting because he was in Napa directing the hand picking of their grapes. The Napa grapes will start their fermentation in California and then the young wine is brought to New England in refrigerated trucks where it is barrel aged and finally bottled. We started the night with a 2009 Jonathan Edwards Chardonnay. It is Estate Grown, meaning the chardonnay grapes are from New England: grown here, picked here, fermented here, aged and bottled in Connecticut. Only certain varietals do well in New England. In addition to the Chardonnay, the Estate Wines include Pinot Gris, Gewurztraminer, and Cabernet Franc. We next tasted three reds, all from Napa Valley grapes: the 2007 Jonathan Edwards Zinfandel, the 2008 Jonathan Edwards Merlot, and the 2007 Jonathan Edwards Cabernet Sauvignon. In each case, the young wine was shipped from California and barrel aged for 18 months in either American or French oak. All were bottled in Connecticut. I particularly liked the Merlot and will be calling on my friends at Cellar 55 Wine Merchants, who carry these wines in Sandwich. 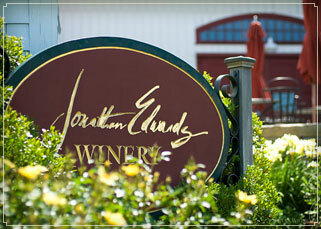 We only tried these three reds, but Jonathan Edwards Winery also features Napa Valley Syrah and Petite Sirah. I look forward to trying the Petite Sirah since I learned Jonathan worked for a time at Vincent Arroyo Winery in Calistoga, CA. Vincent Arroyo Petite Sirah is Jan’s all time favorite wine and we have been very lucky to receive an annual allotment, which we nurse and enjoy all year with some very special friends. I want to try all of these wines when we visit the winery in North Stonington, Connecticut, which is near Foxwoods Resort Casino. This sounds like a fun road trip and necessary to find more great wines for guests at our Sandwich Bed and Breakfast. 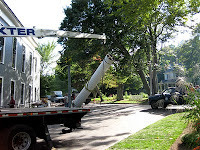 The immediate neighborhood where our Cape Cod Bed and Breakfast is located became the hub of activity for the newly founded Town of Sandwich when Thomas Dexter built his first Grist Mill in 1637. 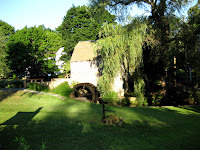 The Grist Mill that stands today behind the Town Hall is an updated version completed in 1654. Other houses built by the earliest settlers started to appear on the newly created roads around what is now Shawme Pond, then called Mill Pond and Mill River. The Hoxie House on Water Street was built for Reverend John Smith’s family in 1640. Grove Street on the west side of Mill Pond saw Peter Newcomb build his house in 1693, at 8 Grove Street, it later become the Newcomb Tavern that played an interesting role in the Revolutionary War. Also at 10 Grove Street, Seth Pope had a house built for himself in 1699 on the lot next door to Newcomb. Another Pope relative, John Pope, also started his house in 1699 at 110 Franklin (now Tupper), less than a quarter of a mile from the site of our future Inn. Just around the bend from our site, at the corner of River and Main, the first Meeting House structure was already holding the official Sandwich Town Meetings. This first meetinghouse was replaced by the Congregational/Unitarian Church that was restored and is now a private residence on the same corner. Also, the Main Street population was growing, with the Bourne house in 1711 at 138 Main Street, and a little further down the street, the Benjamin Fessenden’s “new’ home in 1729. 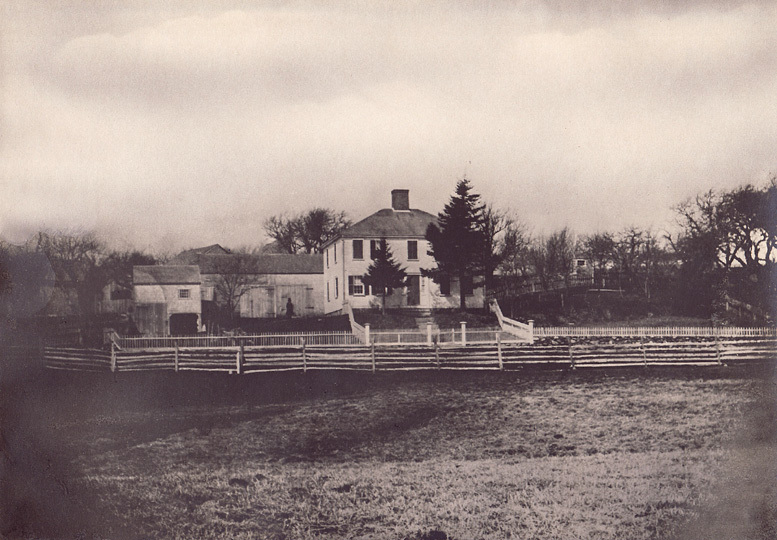 The Fessenden house also became a Tavern with a role in the Revolutionary War. 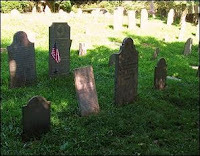 Expansions of the town naturally led to the creation of the first cemetery, the Old Town Cemetery, on Grove Street with the earliest head stones from 1683. 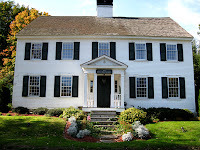 The house that is now our Cape Cod B&B at 118 Tupper Road (then Franklin Street) was built in 1750. Our Inn and 53 other near by properties, including all those mentioned above, is still standing today and is part of the Town Hall Historical District. This district is part of the National Register, which is a “federal listing of historic properties that are worthy of preservation because of their significance in American history, culture, archeology or architecture.” We are pleased that our house stands in this robust company. Early records indicated that a structure of some sort stood on our property as early as 1748. 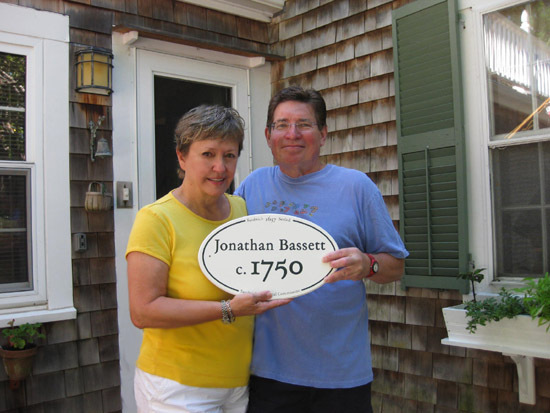 The Sandwich Historical Commission believes that Jonathan Bassett built an original “saltbox” house in about 1750. Jonathan Bassett is believed to be a descendant of William Bassett, Jr., one of the 1637 Sandwich founding settlers. The Bassett’s only daughter, Deliverance, married Elisha Hall (1747-1808) in 1768. Other records suggest that a Hall relative built the first house. All records agree that a member of the Hall family has lived in the house since the 1700's. Although I have no information about the political leanings of Elisha Hall, I like to believe he was among the Patriots. 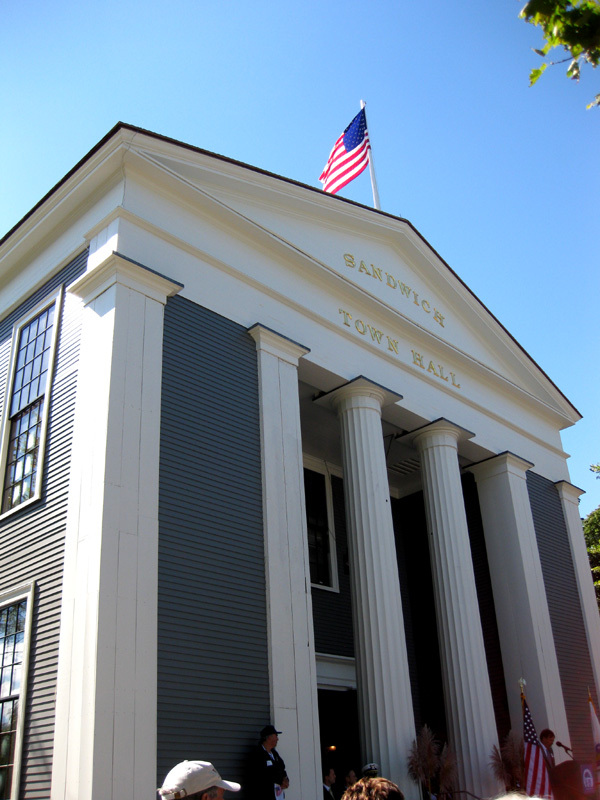 During the period leading up to the Revolutionary War, Sandwich firmly supported the Patriot cause, and in 1773 at Town Meeting passed its “seven resolutions,” which clearly put it in opposition to the King. Elisha Hall may well have attended meetings at the Fressenden Tavern, which was known as the gathering spot for the Patriots. I hope he avoided the crowds at the Newcomb Tavern, his neighbor on Grove Street, which was frequented by the “Loyalist” who supported the King. 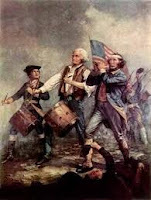 We’re not sure where the Halls stood, but they were present during the Revolutionary War and prospered afterward. Come and celebrate the 260th anniversary of the house the Hall’s built and stay at our Sandwich Inn. Please see our Specials and Holiday Packages on our website. 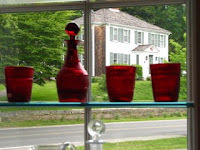 In a previous blog, I reported on a search for Chardonnay to serve guest at our Cape Cod Bed and Breakfast. In August, I tasted and commented on four nice California Chardonnays. Last Friday night I had the pleasure of experiencing some French Chardonnays. The Brown Jug here in Sandwich sponsored the “Wines and Cheeses of France” with wines presented by Gary from Winebow (previously Boston Wine Company). The wines were from some of the key regions of France and were expertly pared with French cheeses by Michael and Steven from The Brown Jug. We experienced seven wines matched with exceptional cheeses. It was a great education about the contrasting flavors and the impressive effect of combining the wine and cheese. The wines included: Domaine de l'Aumonier, Sauvignon blanc, Loire; Simonnet Febvre, Chablis; Saint Aubin Domaine Langoreau, Burgundy; Domaine Newman, Beaune; Clos Salomon, Givry 1er Cru, Cote Chalonnaise; Chateau Lacoste Borie, Pauillac; and finally the Drapier Grande Sendree, Champagne. I do not speak French and am baffled by French labels. Gary does speak French and used colorful maps to explain the origins of each of the wines. As each wine was served, I studied the label and tried to decipher what I heard Gary telling us about the wine. The first wine actually said Sauvignon Blanc, a grape I am familiar with, and “Loire”, a region of France that I had also heard of before. The next two wines were Chardonnay, but you could not tell from the bottles. I liked the Chablis and learned that this is a sub-region of Burgundy with soil that gives the wine a very mineral flavor. 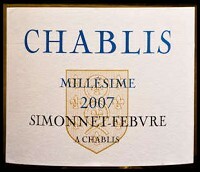 This wines’ label did declare that the 2008 Simonnet Febvre was a “Grand Vin De Bourgogne.” Gary explained that Bourgogne is what the French call Burgundy. I still do not understand if Bourgogne is French for the English Burgundy, since I have also seen the word Burgundy on French bottles. For example, the next bottle we tasted was also a Chardonnay and included Burgundy on the label but was not Chablis. It didn’t get any easier with the red wines. The Domaine Newman and Clos Salmon were both Pinot Noir base wines, but neither said Burgundy or Bourgogne on the label that I could remember. I am known as a Pinot Hound, but I did not flip for either of these two. To be fair to the French Chardonnay and Pinot Noir, even if I cannot read the labels, I need to taste more and should do a side by side tasting with some of my favorite California wines. Oh, what a good idea for another tasting. All in all it was a great evening. I learned a lot about French wine and enjoyed some great cheeses. I look forward to the next Brown Jug event. To celebrate the 260th anniversary of the home that is now our Cape Cod Bed and Breakfast, we are sharing its long and wonderful history. The story of our Inn, and the families that built it in 1750 and have owned over the last 260 years, is intricately interwoven with the history of Sandwich Massachusetts. If you love American history, you will love Sandwich which, settled in 1637 and incorporated in 1639, is the oldest town on Cape Cod. I joke with my guest that it took the first settlers seventeen years to travel the eighteen miles from Plimoth Plantation where English Colonists landed in 1620. Today, it is just a 15-minute trip along state highway Route 3 from what is now Plymouth, MA to what is now Sandwich, MA. In 1637, this was a very attractive area because of its salt marshes, fresh water streams, forests, and access to the Cape Cod Bay shipping waters. 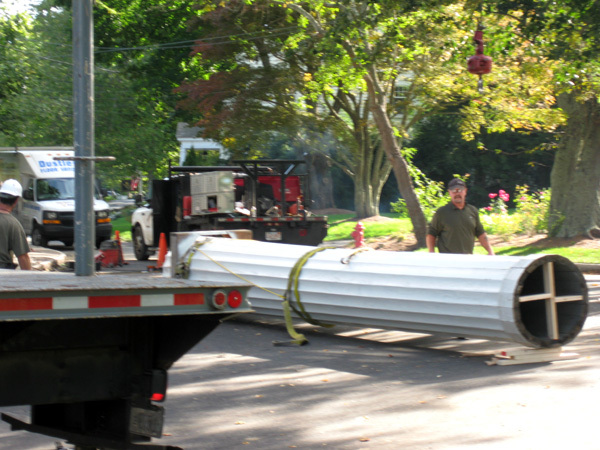 Early settlers soon were drawn to the area immediately across the street from our house, which is at the bottom of what is now known as lower Shawme Pond. Long before the English arrived, the native Indians hunted the area and fished the fresh water Shawme River that started in a red cedar bog in what is now upper Shawme Pond and flowed through the marshes to Cape Cod Bay. As the town developed around our neighborhood, it became the center of commerce and trade and was known as Sandwich Village. A group of founding settlers, known as the “10 men from Saugus,” was given a charter to start the new town of Sandwich by the controlling Plymouth Colony. The group was lead by Edmond Freeman and included Henry Feake, Thomas Dexter, Edward Dillingham, Richard Chadwell, William Almey, Thomas Tupper, and George Kent. Others from Plymouth and Duxbury who were looking for new opportunities quickly joined this first group, including William Bassett, Jr., Richard Bourne, and Thomas Burgess. In the 1630’s, these men and their families defined the future of Sandwich, and their names still are prominent on the historical sites in Sandwich. Guests at our Sandwich Bed and Breakfast walk the Sandwich Heritage Trail that includes the Dexter Grist Mill, built by Thomas Dexter between 1640 and 1646. These industrious men harnessed the river and built this mill that still grinds corn 370 years later, just as it did for the founding families. Jan makes a guest favorite roasted corn/rosemary, cornmeal muffin made with ground cornmeal from across the street at the Grist Mill. Guests love to take home a bag of cornmeal and recipe booklet as a souvenir of their stay in Sandwich. Just past the Grist Mill is the Thornton W. Burgess Museum, the childhood home of the renowned children’s author, naturalist, and descendent of the above Thomas Burgess. A little further up the road is the Dillingham House built by Edward Dillingham and reported to be haunted by ghosts of these founding fathers and others. Our house was built in 1750 by a descendent of William Bassett from these founding families. Next week we’ll talk more about our house and the families that have owned it over the last 260 years. Our house and the town of Sandwich have retained their sense of history and, for that reason, are a great place to visit any time of the year. To celebrate our 260th anniversary, we invite you to join us. Our Specials and Holiday Packages are available on our website. On a rainy Wednesday night, I went in search of new fall wines for wine tastings at our Cape Cod Bed and Breakfast. The weekly wine tastin, sponsored by my friends at Cellar 55, had to move from the outside patio into the main restaurant at the Belfry Bistro in Sandwich, MA. 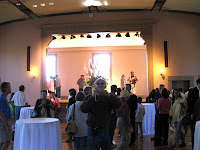 The setting is unique in that it was a Catholic church built in the early 1900s and converted into a fine dinning restaurant about fifteen years ago. The building still has the stained wood cathedral ceiling and beautiful wood paneling through out. 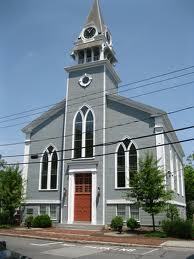 It is very obvious that it had been a church, which made the choice of wines being tasted either ironic or iconic. financial success, but it is not real Zinfandel as far as I am concerned. That may be way too much history, but it is all part of what I love about wine and wine tastings. 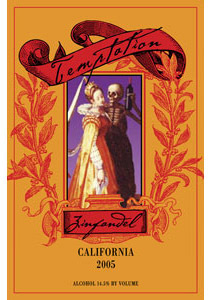 Dave from Cellar 55 and Polly from Classic Wine Imports selected four great California Zins for the tasting. The first three were Alexander Valley Vineyard’s wines made from grapes sourced from three different sub-regions of Sonoma County. 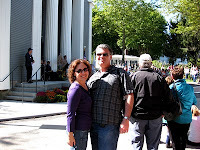 The last wine was from Lodi California, which is south of Sacramento and a much dryer and hotter climate than Sonoma. As Polly said, the four wines show how the same grape can produce very different results based on where it is grown and how the wine maker processes the grapes after harvest. 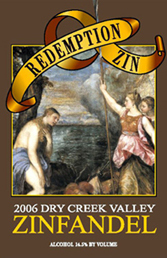 We started with the Alexander Valley 2007 Temptation Zinfandel (Sonoma County), then their 2007 Sin Zin (Alexander Valley) and next the 2006 Redemption (Dry Creek Valley). 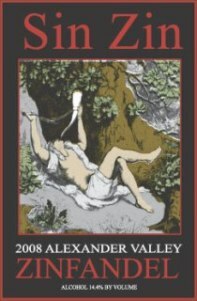 Alexander Valley Vineyards has been making great Zinfandels for over twenty-five years and these three show the great range of flavors that can be produced from this grape even though they all come from Sonoma County. Embrace Lodi's soil, to drink and to feed. Oh Lord, forgive me my zin. Standing like soldiers, the forest of Snyde. Hearts filled with LUST, ole Maley's trees. Court Lodi's sun, and flirt with it's breeze. Vines fattened like turkeys before Thanksgiving feast. Oh Lord, with your help... I'll do it again. What a trip, from temptation to redemption, all in one night. The names and labels alone were worth the price of admission. Guests at our Sandwich Bed and Breakfast love the afternoon treats that we serve. Most often it is fresh baked cookies. 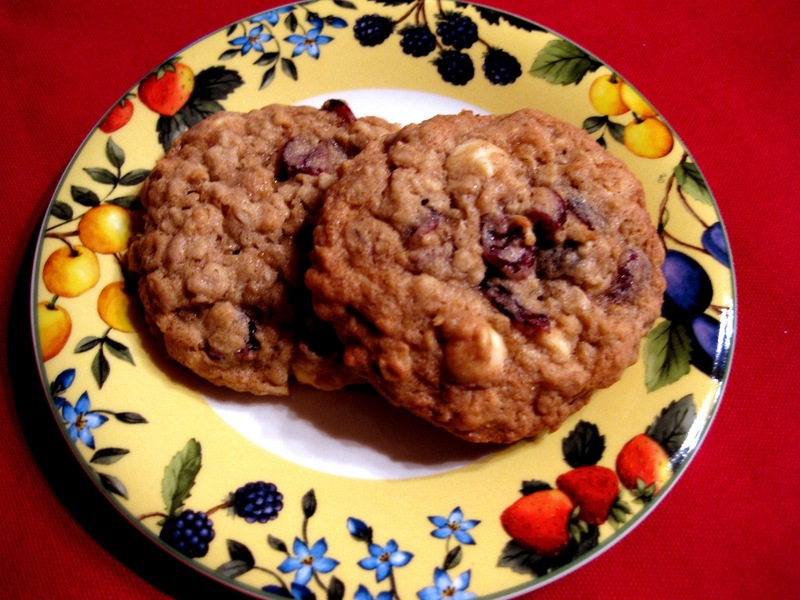 The aromas that waft through the Inn when these cookies are in the oven are killer. If guests are checking into the Inn as these cookies come out of the oven, they can't resist putting down their bags and grabbing one...or three. For those of you who have enjoyed these cookies at our Inn, you can now bake them for your family and friends. If you are going to a "cookie swap" during the holidays, you will be a star with these babies. One and a third cups of top-quality white chocolate morsels (I use Ghirardelli). In a large bowl beat the butter on medium speed until soft and fluffy. Add the brown sugar and orange marmalade and beat until well mixed. Add the egg and vanilla extract and beat again until very fluffy. Beat in the flour mix until evenly blended. Stir in the pecans, cranberries and chocolate morsels until evenly spread. 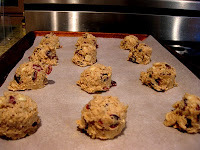 Drop cookie dough onto cookie sheets, about a heaped tablespoon each, spacing about 3 inches apart. I use an ice cream scoop to maintain a consistent size. If you use a larger scoop, you will get less cookies out of this recipe but I love the larger ones. Bake for 8 - 11 minutes, rotating the sheets half way through for even browning. If you use a large scoop, you will have to bake them a bit longer. Be careful not to over cook. Allow to set for a couple of minutes before transferring to wire racks to cool. Plate and enjoy. Note: This recipe is great for scooping into balls and storing in the fridge. Then you can cook them as you need them. 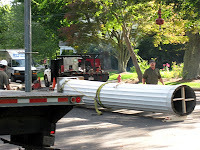 Work across the street from our Cape Cod Bed and Breakfast has been fast and furious all week. 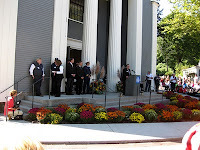 The Sandwich Town Hall re-dedication ceremony is Saturday, October 2nd. at 12:00 noon. On Monday I had my doubts about the work being completed, but all looks good to go now. 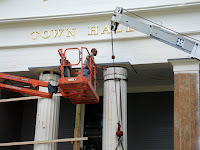 The newly painted, large gold letters declaring SANDWICH TOWN HALL have been returned to their place over the main entrance and the flagpole on the very front roof peak is back and proudly flying a new American flag. 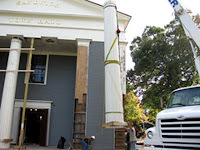 On Wednesday afternoon I watched as the crew gingerly re-installed the two large Greek revival style columns, which have been down for most of the 18-month restoration project. 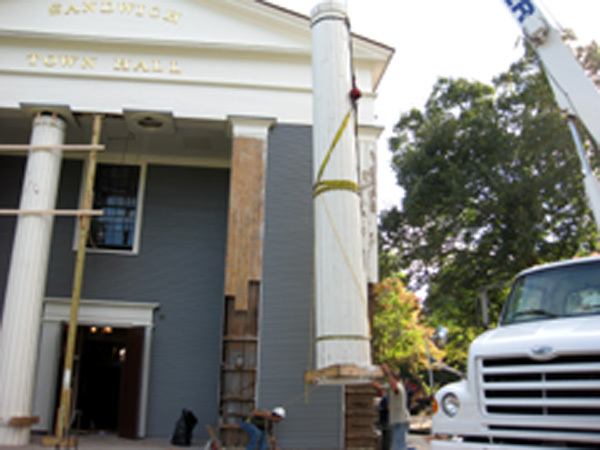 These two-store tall, hollow, hand-made wood columns have been stored on the ground next to the building. 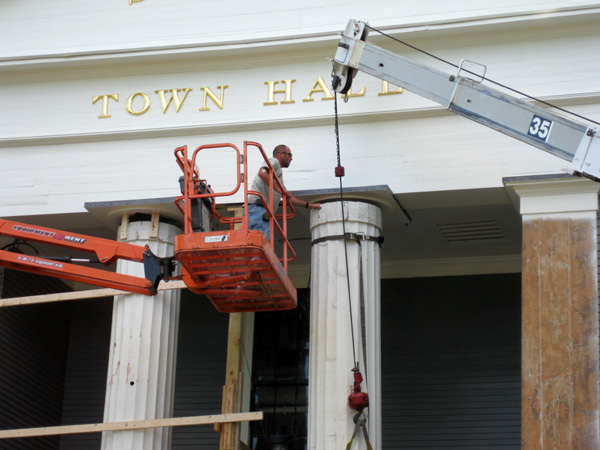 I am impressed by the engineering design and original craftsmanship that created these beautiful, structurally sound, and distinctive architectural features of our Town Hall Square neighbor. As I watch the small construction crew with modern cranes and platform lifts re-install the columns, I wonder how different it was in 1834. Jonathan Hall, the home owner in 1834 of what is now our Sandwich Bed and Breakfast Inn, may have stood exactly where I stood and observed teams of horses and many more men setting these same faux columns the first time. 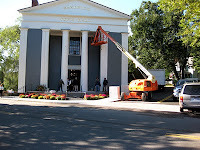 By the ceremony tomorrow, I am sure they will look as good as they did 176 years ago. 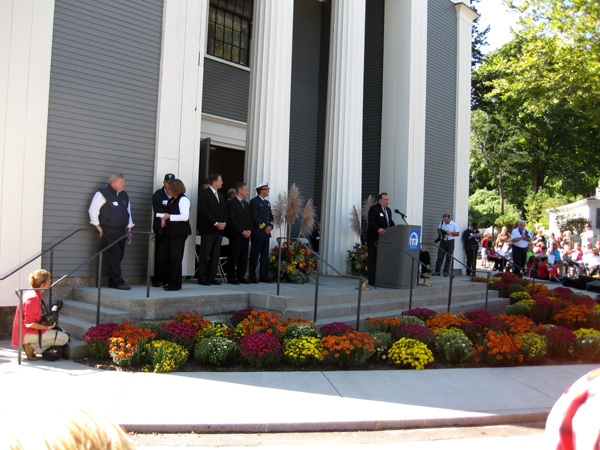 We are inviting the guests at our Inn to join us at the ceremony on Saturday and take the tour of this great historic building. 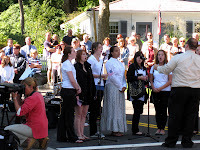 Saturday is also the kick off of the 260th Anniversary Celebration of our circa 1750 Inn. 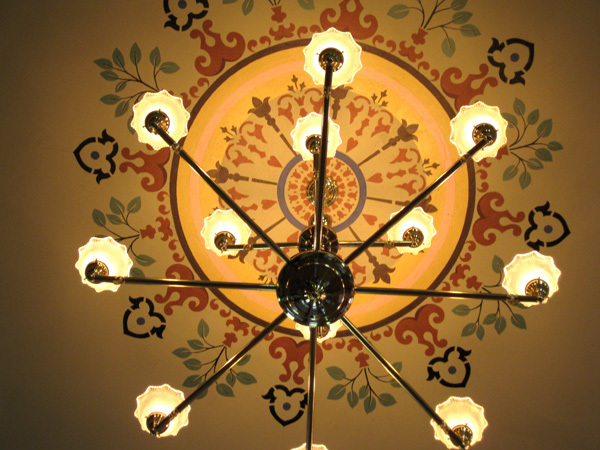 We have special packages and events planned that highlight the history of this lovely historic home.